Southern Californian by birth, Jennifer Walton attended Brooks Institute of Photography, graduating with a degree in Visual Journalism. A previous decade in the music industry in artist management afforded her extensive travel and a wide-angle view of the indisputable wonders and anguish in the world. 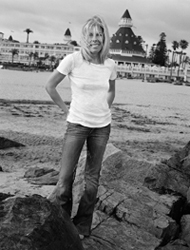 In 2002, Jennifer began documenting the lives of the U.S. Navy SEALs and their families as a writer and photographer. What she learned inspired her to respectfully commit all her journalistic skills to dispelling insipid falsehoods and simplistic stereotypes about the men who go to war for a living. The story she tells in this book is both savage and tender, exposing truths as complicated as the men and families she came to know during her research. Duality is a necessary barometer for good journalism, and Jennifer strives to avoid professional acquiescence by seeking out controversial and important topics. Her inspiration comes in the forms of travel, music, and the ordinary lives of extraordinary people. From the Tetons to the Himalayas, her daughter often accompanies her as she continues to devote her time to long-term projects on the environment and conservation. This is her first publishing adventure. Copyright © 2009 Stephanie Freid-Perenchio and Jennifer Walton. All Rights Reserved.